The early chapters of Genesis help us understand how sin entered God's good world and corrupted it to the point that God had to move to deal with sinful humanity. Sin always damages God's good will for people. The story of the flood reveals God's determination to deal with evil, but also demonstrates His love by providing a means of rescue and restoration. 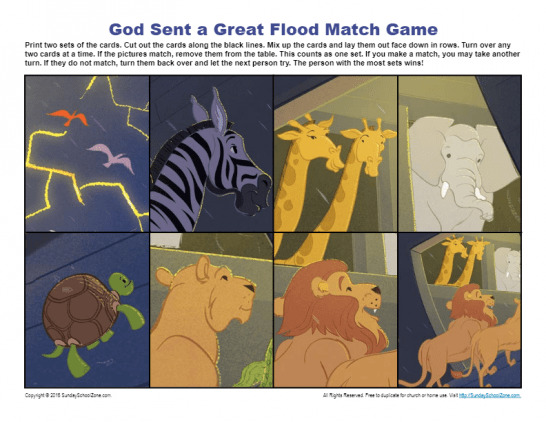 These free, printable Noah and the Flood Bible activities are about the great flood. When humankind became corrupted in Genesis 7, God sent a great flood as judgment. Of all the people, only Noah (and his family) found grace in God’s eyes. 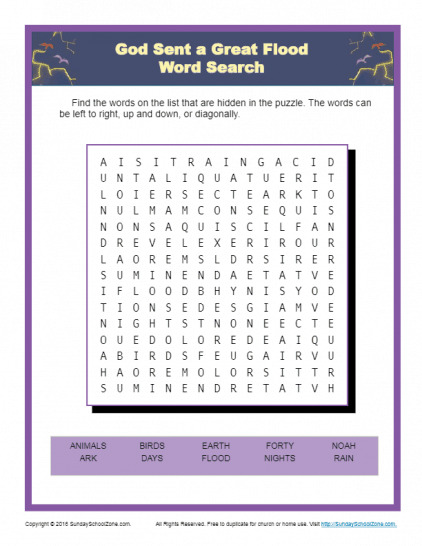 This word search activity will help kids remember that evil is punished but God is gracious. When mankind became corrupted in Genesis 7, God sent a great flood as judgment. Of all the people, only Noah found grace in God’s eyes. This match game will help children remember that evil is punished but God is gracious. 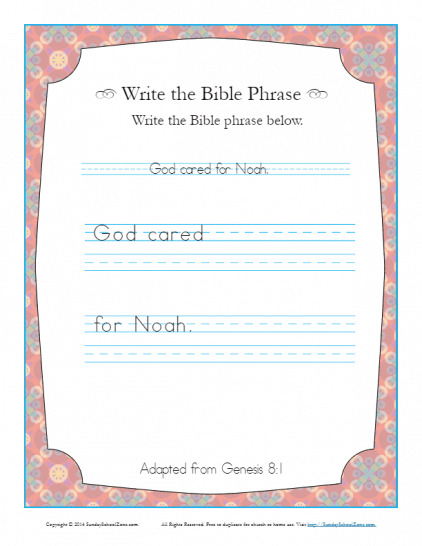 This Write the Bible Phrase Worksheet calls for kids to write, “God cared for Noah.” This is an adaptation of Genesis 8:1 and will help children remember that God cares for us just as He did for Noah. This is an important lesson for kids to learn early. 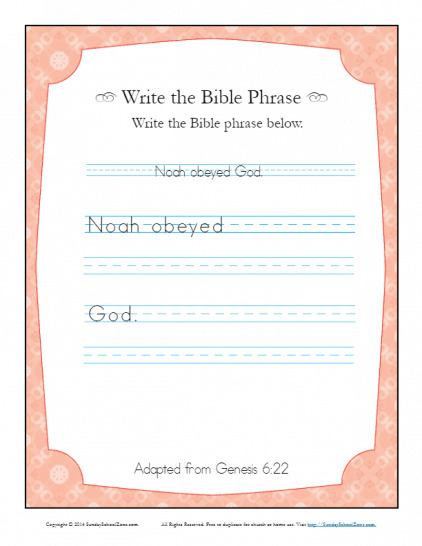 This Write the Bible Phrase Worksheet calls for kids to write, “Noah obeyed God.” This is an adaptation of Genesis 6:22 and will help children remember that everyone should trust and obey God. This is an important lesson for kids to learn at a young age. 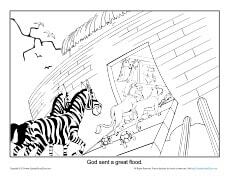 This coloring page, based on Genesis 7:1ff, will help children understand that animals and people are different. God holds people to a higher standard of living. It can be used in a homeschool setting, one-on-one, or in a classroom setting like Sunday School. 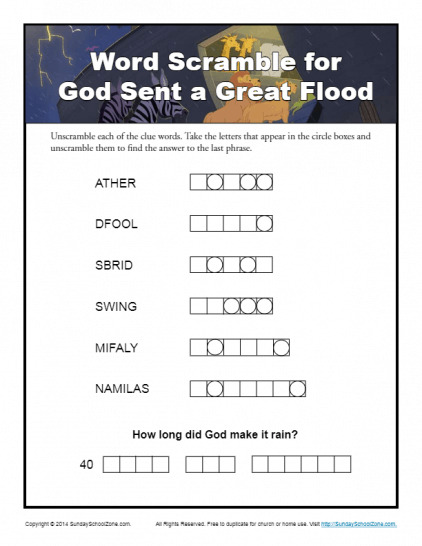 Working to unscramble words is both challenging and fun, and when the theme of the exercise is the story of Noah and the flood, those doing the exercise spend more time with the details of the Bible story. Sharpen your pencils, this is a wonderful Bible exercise! 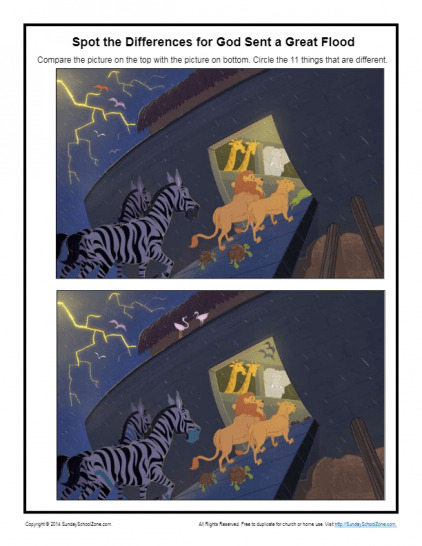 Pull out the markers and get ready to find 11 differences between these two pictures of animals stepping aboard the ark just before the flood comes. This is a great Bible exercise and will remind children that God is a gracious God even while judging sin. This 10-piece jigsaw puzzle is a fun activity carrying a Noah’s ark theme. 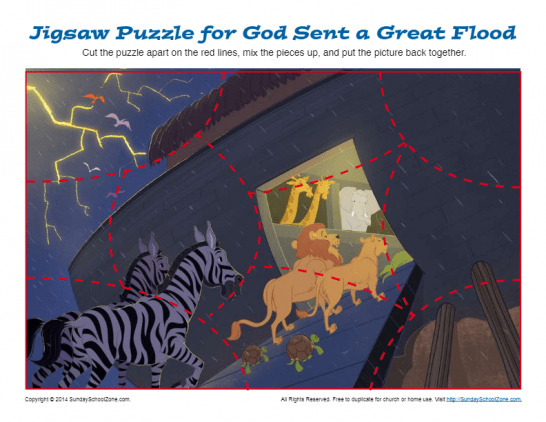 Children will have a great time putting this puzzle together while learning about the story of Noah and the ark. Kids will learn that God is a gracious God even while bringing judgment on sin. 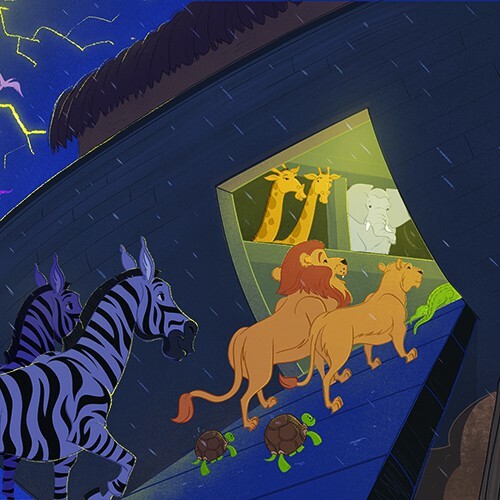 There are 14 hidden Ns in this picture of Noah’s ark? Can your children find all of them? After they do, they can color the picture. 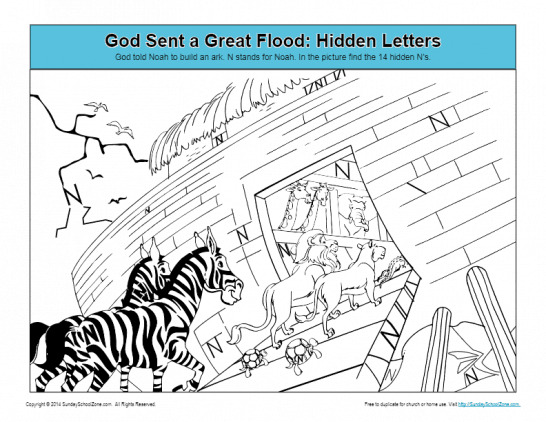 This hidden pictures activity will help kids learn about Noah and the ark and that God is gracious even while bringing judgment.